Emily Flaherty '19 first joined us as a SURF fellow in June of 2016. She looked at aspects of Kalle's project investigating acetylation as a mechanism that that regulates virulence of V. cholerae towards Drosophila. 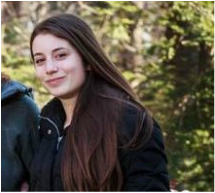 During the 2018-19 year, she is completing her senior this in Chemistry in our lab, working on a collaborative project with Josh Sharp at NMU! Elisa Bello '19 joined the lab as a senior honors thesis student in Biochemistry/Biophysics to investigate acs regulation, continuing some aspects of both Duy's and Itai's projects. Sarah Wishloff '19 has been working on the Vibrio fischeri project, pioneering our mutagenesis screen! Caroline Ferguson-Dryden '20 and Bella Palma '20, both alums of Biol-271 Microbiology w/lab, joined us in the Fall of 2018 to continue our hunt for novel regulators of acetate metabolism! Gabby Ro '19 joined us as a Greg Call Fellow in August of 2017. She wrapped up the project investigating acetylation in V. cholerae, contributing to our publication in Applied and Environmental Microbiology. In 2018, she started her senior honors thesis in Biology, switching gears to work on V. fischeri​! Kennedy Countess '18 joined the lab in the fall of 2018 as a postbac fellow after graduating with a major in History! As an alum of Biol-271 Microbiology w/lab, she is working on several projects in Vibrio fischeri! Kyra Raines '20 was also a SURF fellow in the lab, working on the Vibrio fischeri ​project, in 2017. 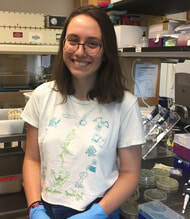 She continued in the lab during the 2017-18 year, and then returned home to Madison to spend the summer of 2018 in Mark Mandel's lab at the Univ. of Wisconsin! Anna Buford '20 and Will Dunne '20 are also hard at work on search for new regulators of acetate metabolism in Vibrio​ in the Fall of 2018, having completed Biol-270 Microbiology in the spring! Cecilia Prado joined us as a research assistant in February 2016. She completed her BS at UMass-Amherst in Microbiology, and she keeps the lab running (as evidenced by her appearances in so many pictures!) She is an enthusiastic and creative presence in the lab, and she's also interested in science communication and science writing! 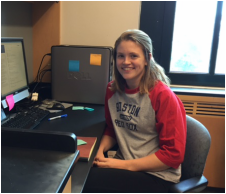 Sarah Nessen '18 joined the lab as a senior honors thesis student in August of 2017 to continue the V. fischeri ​project! She gave an excellent talk at the American Society for Microbiology Vibrio2017 meeting in Chicago, and she was Biology's representative in Amherst's 3 Minute Thesis competition! After completing an excellent honors thesis in Biology, she is teaching in English in France for year, while preparing to apply to medical school! Congrats Sarah! Itai Muzhingi '18 joined the lab in the fall of 2016, and continued as a thesis student in the Biochemistry/Biophysics Program in the 2017-2018 academic year. He won a poster award (for graduate students) at the American Society for Microbiology Vibrio2017 meeting in Chicago! He completed a superb thesis, and is now a research assistant in Bruce Walker's lab at the Ragon Institute, while he applies to medical school! Duy Nguyen '17 joined to lab in January 2016 to help wrap up a small project on house flies in collaboration with John Stoffolano at UMass-Amherst. As a tremendously dedicated thesis student in the lab, he worked on regulation of the ​crbS and ​crbR genes! He also pioneered the introduction of HCR-FISH to the lab -- a tremendous feat. He is applying to medical school and MD/PhD programs, and working as a research assistant at the University of Pennsylvania. 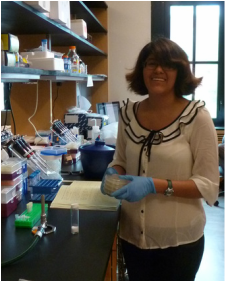 Stephany Flores-Ramos '17 joined the lab in June of 2015 as part of the Summer Undergraduate Research Fellowship (SURF) program at Amherst College. She received a Kaufman Fellowship to fund an internship in Ned Ruby's lab in 2016, where she learned all about the Vibrio fischeri-Euprymna squid symbiosis! As a thesis student, she began a collaboration with Mark Mandel to study CrbS and CrbR in V. fischeri. She is currently a research assistant in Katherine Lemon's lab at the Forsyth Institute. Kalle Liimatta '16 joined the lab in June of 2014 as a Sarles Fellow supported by the Summer Undergraduate Research Fellowship (SURF) program at Amherst College. She continued in the lab as a thesis student, and she presented her findings both at the inaugural Pioneer Valley Microbiology Symposium in January 2016, and at the American Society for Microbiology Microbe 2016! She is now a research assistant at Columbia University! Mariame Sylla '15 joined the lab in the fall of 2012, and stayed on during the summer of 2013 as a Howard Hughes Medical Institute summer research fellow, and she completed an excellent thesis looking at regulatory pathways affecting acetate uptake by Vibrio cholerae in 2015. After participating in the INRO program at the NIAID at the National Institutes of Health in February '15, she is now a postbac fellow at the NIH, and will be attending Harvard Medical School in the fall of 2017! Monica Cesinger '15 joined the lab in August of 2014 to look at different regulatory pathways mediating acetate uptake by Vibrio cholerae. She completed a really outstanding thesis and graduated in 2015. Luckily, she stayed on in the lab over the summer as postbac fellow to wrap up a few experiments. She started her PhD at the University of Washington in microbiology in the fall of 2016, where she joined Houra Merrikh's lab! 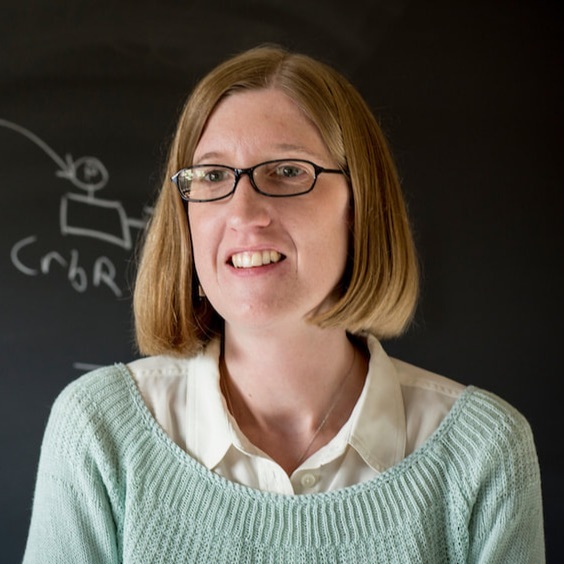 Franny Diehl '15 joined the lab in the summer of 2014 and completed a fantastic honors thesis in the lab in the spring of 2015 focusing on a structure-function analysis of the CrbRS two component system. She will be completing her PhD in Biology at MIT in the Vander Heiden lab! Congrats Franny! Paul Tyler '14 joined the lab in August of 2013, and he too completed a phenomenal honors thesis in the lab in 2014. He is working as a research assistant in the Dougan Lab at Dana-Farber and he entered the PhD program at Yale University in the fall of 2016! Congratulations Paul! Mariah Servos '14 joined the lab in the summer of 2013, completed a stellar honors thesis during the 2013-2014 academic year, and she is now working as a research assistant in the Dougan Lab at the Dana-Farber Cancer Center and begat at Dartmouth for medical school in the fall of 2016. Congrats Mariah! Anna setting up an experiment in our wonderful fly room! Anna Rasmussen '13 completed her excellent honors thesis in the lab in the spring of 2013. She was instrumental in getting the lab up and running, troubleshooting protocols, making our lab's first V. cholerae mutants. After working in the Oono Lab at UC Santa Barbara on microbial symbionts of plants, she was a research assistant in the Chisholm Lab at MIT. She received an NSF Graduate Research Fellowship, and she started her PhD in microbial ecology in Chris Francis' lab at Stanford in the fall of 2016! Rachel Seifert '19 is a Biochemistry/Biophysics major and she worked on regulatory pathways leading to acs regulation in V. cholerae! SabriAnan Micha '19 worked on the Vibrio fischeri project in the spring of 2017! Jenny Kim '19 helped us out with a number of experiments, and most recently helped with the V. fischeri project! ​Abby Mesfin '20 was a SURF fellow in the lab in 2017, working on the Vibrio fischeri ​project, and she continued in the lab as a research assistant during the 2017-18 academic year! Victoria Luizzi '16 joined to lab in January 2016 to help wrap up a small project on house flies in collaboration with John Stoffolano at UMass-Amherst. Angelika Hirsch '19 worked on the Vibrio fischeri project in the spring of 2017! Libby Daniele was a research assistant in the lab, and a recent graduate of UMass-Amherst. She made a lot of progress on various genetic constructs, and she is back at UMass now... and sorely missed! Azka Javaid '17 joined the lab in 2014, and she helped out with a project to generate a lacZ fusion to a gene that may be involved in acetate uptake. Catherine Choi '15 also joined the lab for the summer of 2013 as an academic intern. She performed a variety of biochemical tests to characterize bacterial strains that for Biology 271 Microbiology lab. Lucy Xu '14 helped us care for our flies and she performed regular assays to guard against infection of our fly stocks. She is attending medical school. Best of luck, Lucy! John Kim '15 joined the lab for the summer of 2013 as an academic intern helping to characterize bacterial strains for the laboratory portion of the Biology 271 Microbiology course. He also worked on protocols related to developing student projects that will characterize the Drosophila microbiome in the course. Maureen is the behind-the-scenes coordinator of all things biosafety, Drosophila, and lab set up.